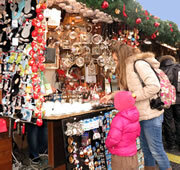 The Prague Christmas markets are open daily at the Old Town Square and Wenceslas Square. A 'winter wonderland' awaits, for visitors to soak up the festive atmosphere, browse the stalls, and enjoy Christmas carols, hearty food and local drinks - photos. 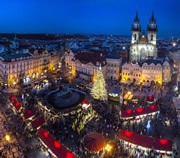 The Prague Christmas markets are open every day from 30th November 2019 to 06th January 2020, including on Christmas Eve, Christmas Day and New Year's Day. 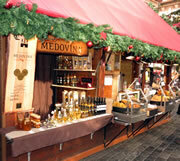 The main markets are at the Old Town Square and Wenceslas Square (5 minutes walk from each other). There are also smaller markets held at Republic Square, at Havel's Market, on Kampa Island and on the square in front of St. George's Basilica at Prague Castle. 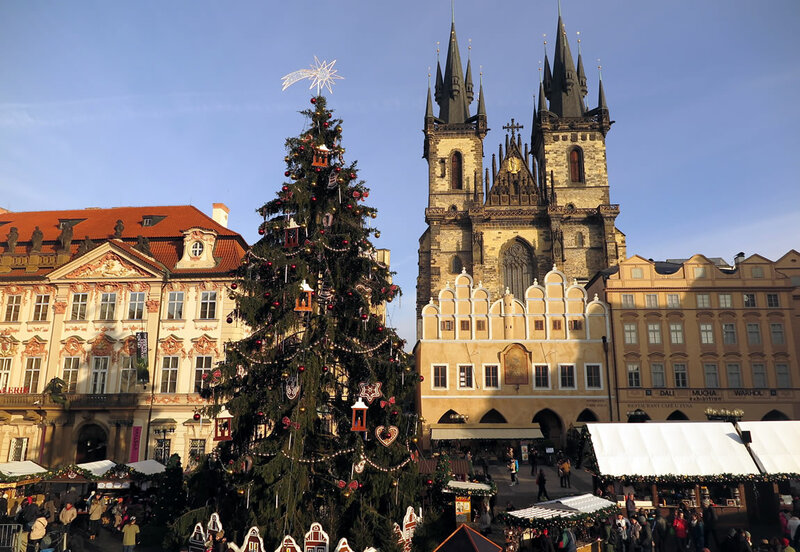 Note: The Prague Castle Christmas market starts one week before the main markets, on 23rd November 2019. 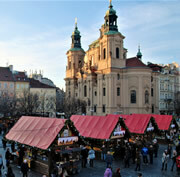 What are the Prague Christmas Markets? The Prague Christmas markets consist of brightly decorated wooden huts stocked with local handicrafts and traditional Christmas treats. Items on display include ceramics, jewellery, embroidered lace, wooden toys, scented candles, Christmas tree ornaments, hats and gloves, and puppets and dolls dressed in traditional costume. Visitors should find some nice souvenirs to take home to decorate their houses with or to use as gifts. Christmas market food There is all manner of local food and drink to sample, much of it prepared at the stalls in front of you. 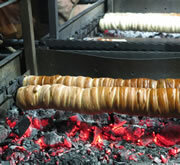 Popular food on offer includes: large hams roasted on a spit (Pražská Šunka); terribly unhealthy but wonderfully tasty barbequed sausages (klobása); Hungarian flatbread topped with garlic, cheese and ketchup (langoš); pancakes (palačinky); and a variety of sweets and cakes, such as spicy gingerbread and a hot sugar coated pastry (trdelník). For drinks, try one of the famous Czech beers: Pilsner Urquell, Staropramen or Budvar. Or opt for a hot drink: honey wine (Medovina); mulled wine (svařák); hot chocolate (horká čokoláda); or grog, a mixture of rum, water, lemon and sugar. Outdoor Christmas shopping is so much nicer with a mug of hot mulled wine in your hand! Other attractions include an animals stable at the Old Town Square, where children can stroke sheep, goats and a donkey. And at both the Old Town Square and Wenceslas Square there are wooden stables containing a Bethlehem scene depicting Mary, Joseph, baby Jesus and the Three Kings. But what is Christmas without carols? School choirs and folk groups perform late afternoon on a stage at the Old Town Square dressed in traditional costumes. Children travel from all over the country to appear. Most impressive of all is the mighty Christmas tree at the Old Town Square, transported from the forests of the Liberec region of the Czech Republic. The tree is dressed with baubles and draped in a blaze of lights, which are switched on at 4:30pm every day. It is a spectacular sight set against the dark gothic skyline. Wenceslas Square has a brightly lit Christmas tree too, with its lights switched on at 5pm every day. Both tree lightings are accompanied by rousing music. Old Town Square: First Lighting 16:30. Last 21:30. Wenceslas Square: First Lighting 17:00. Last 21:00. 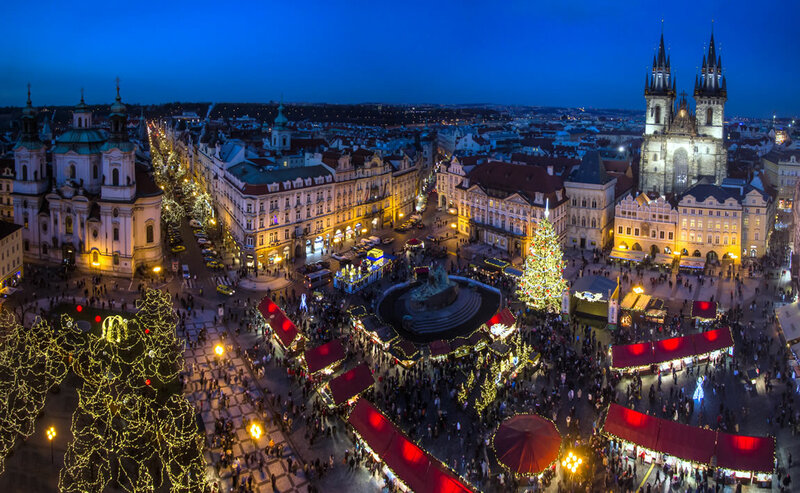 The festive atmosphere in Prague in December is simply wonderful. The theme for the Prague Christmas markets last year was 'Fairy tales'. The theme for 2019 will be announced towards the end of November. The city centre is called Prague 1, which is made up of several areas. 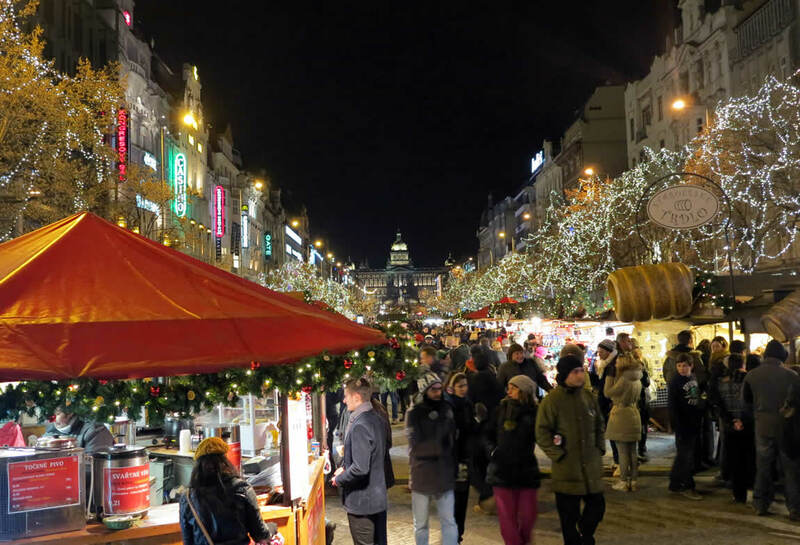 The two most popular areas to stay in for the Christmas markets are anywhere in the Old Town and anywhere near Wenceslas Square in the New Town. Next most popular is the Lesser Town, which is on the other side of the river and easily accessible by strolling across Charles Bridge. The city centre is compact and highly pedestrianised, so the three areas are within easy walking distance of each other. Wenceslas Square markets The sightseeing, entertainment and nightlife is mostly located in these three areas too. Therefore, book a hotel in Prague 1 and the Christmas markets, sights and attractions, restaurants, theatres, concert halls and shops will all be nearby. 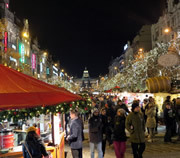 And as the markets are free to enter, whenever you fancy dropping in you can leave your hotel and be in the midst of the festive action in minutes: grab a drink and a hot snack, browse the stalls, soak up the atmosphere, then when you're ready for a warm bath, it's just a short walk home - Prague hotels. The weather in Prague in December is highly changeable. The average low is -2°C (28°F), but the temperature deviates dramatically in both directions. There are bright, sunny, relatively warm periods. Equally, there can be heavy bouts of snow that last several days or weeks, when temperatures head well into minus territory. In terms of clothing, bring a warm winter jacket, hat and gloves, and as Prague is a wonderful city to explore on foot, a comfortable pair of walking shoes.. Most tourist establishments welcome visitors in casual attire, although you will need to dress reasonably smartly for high-end restaurants and opera houses. Sightseeing in Prague is enchanting, with ancient monuments and magnificent squares to explore, and a dramatic history to uncover. And the festive atmosphere in December lends the city an even greater charm than usual. 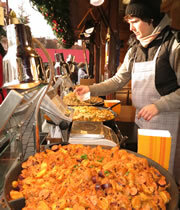 Most sights and attractions are open throughout the time of the Christmas markets, except on Christmas Eve. A sightseeing trip led by a knowledgeable local guide can help visitors discover the true beauty of the city - from walking tours to coach tours to river cruises, there are plenty of ways to explore Prague - Prague sightseeing. There is lots of entertainment on offer too, including special Christmas concerts and Christmas events. We particularly recommend attending a classical concert. Concerts held in churches and other historical buildings are magical at this time of year, both the Christmas concerts and regular performances - Prague classical concerts. If you are seeking a typically Czech experience, the black light and marionette theatres stage productions suitable for all ages and nationalities - Prague theatre. And the Medieval Tavern and Traditional Czech Night showcase Czech hospitality. The warm and friendly atmosphere at both events is well suited to a cold winter's night. For information on what's open in Prague: Christmas opening times. -31st December: New Year's Eve Planner. For an introduction to the city: Prague tourism information. For practical information, including currency exchange: Prague Tourist Information. For travel advice: Travel to Prague and Travel around Prague by public transport. 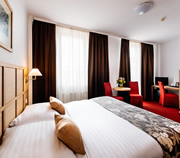 For a simple way to arrange your Prague city break: Prague Package. at Old Town Sq. & Wenceslas Sq. -21:00 Open-air Christmas Mass at Old Town Sq. at Ovocny trh, a square near Estates Theatre, Old Town.